Virginia Tech led the entire way and notched an important ACC road victory, beating Notre Dame 67-59 in South Bend Saturday evening. With the win, Virginia Tech improves to 21-6 overall (10-5 ACC), while Notre Dame falls to 13-14 (3-11). 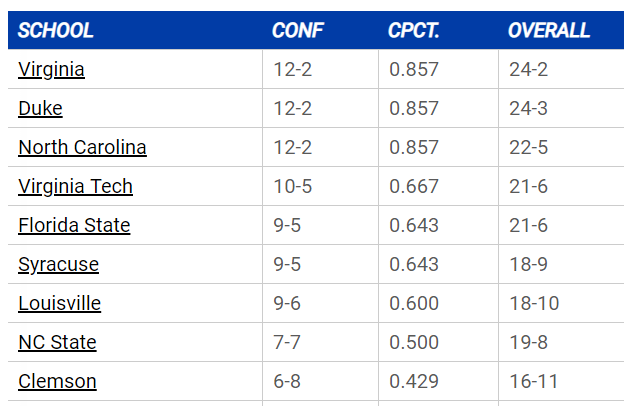 Virginia Tech’s win, combined with other results around the ACC Saturday, puts the Hokies in sole possession of fourth place in the ACC at 10-5. As has been the norm the last few games without Justin Robinson (who once again sat out with a boot on his injured foot), the Hokies weren’t very efficient offensively, but were led by another dominant performance from Kerry Blackshear, Jr. Blackshear scored 22 points and had 14 rebounds and three assists, leading the Hokies in all three categories. Virginia Tech was only 19-of-52 from the field (36.5%) as a team. Blackshear made 7-of-12 from the field, while his teammates shot just 12-of-40. Blackshear was 1-of-2 from behind the arc and 7-10 from the free throw line. In the month of February, he has shot 46-77 (59.7%) overall, 9-of-17 (52.9%) from three-point range, and 40-of-48 (83.3%) from the free throw line, averaging 20.1 points and 9.3 rebounds. There were few other bright spots for Virginia Tech offensively. Nickeil Alexander-Walker scored 12 points but was just 2-of-8 from the field, though he did break out of a recent free throw shooting slump to make all seven of his free throws. Alexander-Walker had two assists and five turnovers. The Hokies as a team shot just 5-of-18 from outside, missing all six of their three-pointers in the second half. Tech as a team turned it over 16 times, compared to just ten turnovers for Notre Dame. But the Hokies dominated several stats, outrebounding Notre Dame 49-27, including a staggering 18 offensive rebounds. The total rebounds and offensive rebounds were both season highs. Tech thus led second-chance points 15-11, and despite the turnover disparity, the Hokies outscored the Fighting Irish 19-2 in fast break points. Defensively, Virginia Tech was once again stout. Notre Dame shot 19-of-58 (32.8%) overall, including 6-of-26 (23.1%) from outside. Notre Dame did make 15-of-16 free throws, but Virginia Tech outscored them from the line, going 24-of-31 (77.4%). The Hokies got off to a 14-4 lead on a three-pointer by Ty Outlaw (nine points) with 12:24 to go in the first half. Notre Dame eventually cut the lead to 25-21 with 3:27 remaining in the half, but a three-pointer by Isaiah Wilkins, who played well off the bench, pushed the lead back out to 28-21, and Notre Dame never got the lead back below five points the rest of the game. Wilkins was the only Hokie other than Blackshear to shoot over fifty percent for the game, making two of his three shots and scoring eight points and grabbing seven rebounds in 16 minutes. Virginia Tech shot just 9-of-26 (34.6%) in the second half and missed all six of their three-pointers, but they held the Irish at bay by making 19 of 25 free throws and turning it over just five times after the break. For the game, Notre Dame had 25 fouls to 18 for Virginia Tech, as the Irish fouled late to try to come back. No one fouled out for Tech, and Blackshear finished the game with just three fouls. Against Virginia Monday night, four Hokies played 40 minutes, but Tech head coach Buzz Williams was able to distribute minutes better this time around. Wilkins (16 minutes), PJ Horne (9 minutes), and Jonathan Kabongo (2 minutes) spelled the starters. Ahmed Hill played 38 minutes, Alexander-Walker 36, Wabissa Bede 35, Blackshear 33, and Outlaw just 31. Bede went 0-3 from the outside, running his string of missed three-pointers to 11 straight after an 18-of-38 start to the season, but he scored six points, had eight rebounds, and led the Hokies with three steals. Virginia Tech’s next game is Tuesday night at home against Duke, who won on the road at Syracuse 75-65 Saturday night. Zion Williamson did not play against the Orange, and his status with a sprained knee is day to day. The game is set for 7 PM and will be televised on ESPN. Buy your tickets from StubHub by clicking here. – Blackshear has been on a tear as of late, scoring at least 20 points in his last three games for the first time in his career. In his last three contests, the Florida native is averaging 24.7 points, 12.0 rebounds and 2.0 assists, while shooting an impressive 71.4 percent from the field. – With 10 ACC wins, the Hokies have now won exactly 10 league games for the fourth year in a row. The five conference road wins match last year’s total, which ties the best mark in the Buzz Williams era. – The last time Tech had 15-plus offensive rebounds was on Jan. 16, 2016, when it registered 18 against NC State. – The Hokies have won two straight on the road at Notre Dame for the first time in school history. Last year, Tech won 80-75 for its first win ever in Notre Dame. 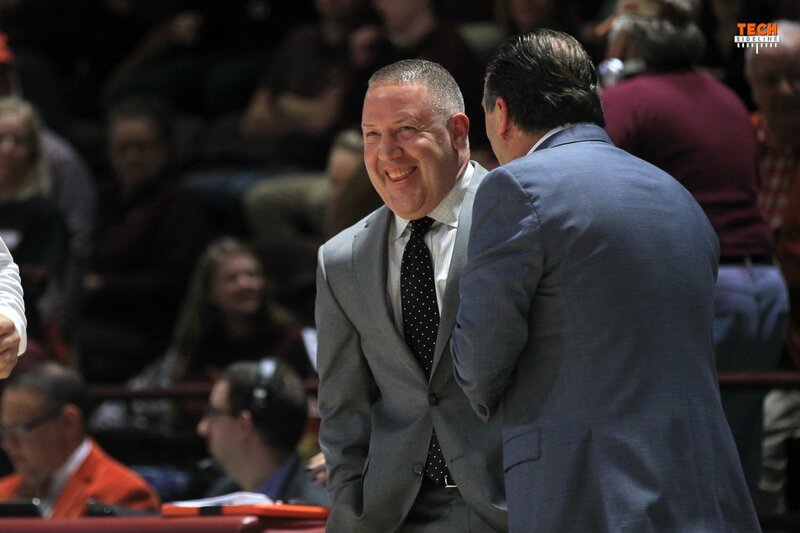 – The Hokies were a force on the boards, winning the rebounding margin 49-27. The 22-board difference is their best this season in a league game and tied a season high versus North Carolina A&T on Dec. 19. I think Wilkins needs to start. Bring Hill off the bench. Didn’t he have many of his best games coming off the bench? Great win. Are we ever going to really get the scoop on Justin and what is wrong and when he will return. Not sure why Buzz is keeping it such a mystery. No inside info anyone has heard? Totally agree. Stopped watching because of their bias. Always fun to beat the Irish in anything. I rewatched and didn’t take it that way. I thought they were saying VT was really better and out played ND, but only down 7 despite being out played. Lots of positive comments on Buzz and Kerry B. No one else on VT deserved much praise, but they talked about how we can light it up from 3. Also talked about how the team knew how to keep it out of the paint and to stop drives. I thought they were biased towards VT – but, I didn’t watch the half time show, so don’t know about that. Coach Buzz is doing a great job. So is Blackshear. Sure miss Robinson driving and distributing. Bede still can’t or won’t score. Did this guy score in high school? ND wanted to win this game. They played “hard”. Guess their motivation was to get a win over a ranked team. VT surely struggles on offense w/o Robinson. Is there any news on # 5’s return? It was a gutty performance from VT- not pretty but a w nonetheless. Beat FSU and Miami and we still could get the double bye. I would have never thought possible when we lost JR. Kudos! Hill still can’t shoot for some reason. The proverbial taking care of business…but taking care of business after having to re-tool the game plan w/o JRob is impressive. Yes, they have played surprisingly well w/o five: kb has upped his game and figured out how not to foul out; the bench has gotten valuable playing time. This could all be sort of a blessing in disguise, if five is ready for the post season. Thanks. Gotta flex those recap muscles every once in a while.